“Ragnvald danced on the oars, leaping from one to the next as the crew rowed. Some kept their oars steady to make it easier for him; some tried to jostle Ragnvald off when he landed on them. The wind from the mountains, a breath of lingering winter, swept down the fjord, whistling through the trees that lined the cliffs . . .” This is how the saga begins. The words, paragraphs, and pages that follow soon bring the first chapter to a suspenseful conclusion. Linnea Hartsuyker draws you into the action rather quickly. You want to get on with it. Soon you will want to stay with it. Why sleep? Why eat? You’ll not want to put it down! All the chapters are like this: suspenseful, intriguing, gripping! So what makes this novel so unusual? This is Linnea Hartsuyker’s first novel, the first of a three-volume saga. And it is full of excitement. 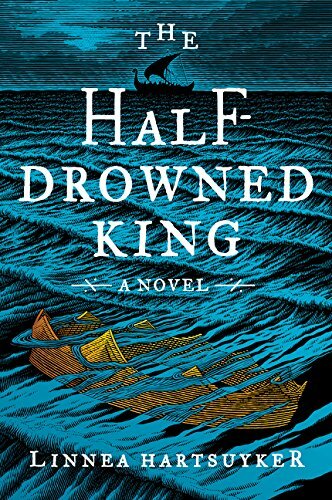 This first book in her trilogy involves intrigue, bloody battles, and a list of characters, both good and bad, who are involved in the rise to power of Norway’s first king, Harald the Fair-Haired. Thus the backdrop is ninth century Scandinavia. We expect her next two editions will follow suit. She has a knack for sound character development. One would not expect this from someone with an engineering degree even if that person also sported a graduate degree in fine arts. Interestingly, while conducting her research for this novel Hartsuyker learned that her own lineage can be traced back to King Harald. It goes without saying she did her research well. As stated above her characters are well developed with very interesting personalities and idiosyncrasies. The events are so vivid that one could easily surmise that this is a true history, not a fictitious interpretation of it. You feel as though you have gone through an out of body experience looking down watching the story unfold. Unlike many adventure novels Hartsuyker has given us both a hero, Ragnvald, and a heroine, Svanhild. They are brother and sister. He is older than she. Both are at the mercy of a wicked stepfather. This part of the novel is only a substory, yet one that is woven quite well into the main plot. There are other subplots as well. Take for instance Hakon and his son Heming. Heming was so controlled by his father that he could not breathe—figuratively speaking. He, Hakon, tried hard enough to win his father’s approval, but his accomplishments were never good enough for his dad. So to gain attention he took to doing dangerous things to gain the approval he so needed and sought. It almost cost him is life on numerous occasions. He was saved by . . . well you ought to read the book not only to find out how he survived, but who made it all possible. That subplot is so important for fathers today. Provided of course they notice. Sons need room to grow, in addition to their father’s guidance and approval. Perhaps it is because a woman wrote the book that this developmental fact is so spot on. Treachery and astonishment and surprise are always right around the corner. Eventually you come to expect one of the three. You prejudge when one of them will jump out at you. You anticipate when. Then they do not. You will be somewhat disappointed, and then the unexpected happens. What clue did you miss? Should you back up to the beginning of the chapter to try to determine how you were caught off guard? Perhaps you will decide to finish the book, learn how it ends, and then go back and read it again to figure out how the author surprised you over and over again. Maybe, just maybe there are no clues there to be found. Then again, perhaps there are. Well, the idea has been planted. Needless to say both hero and heroine have their enemies. Ragnvald has pledged to protect his sister, but eventually they find themselves . . . No, that part of the story cannot be told without giving something crucial away. You will simply have to read the book and find out for yourself. As with all great historical fiction, there are strong similarities to actual events. Good research is very important to a believable historical novel. This book has it. If you enjoy Bernard Cornwell, do not pass this book by. It is well worth the read!